DERRY -- Residents were evacuated from a small apartment building after a thirdfloor unit caught fire yesterday. Firefighters arrived at 12A South Avenue for a reported fire just before 2 p.m. where crews observed thick black smoke and fire showing from the windows of a third-floor, two-bedroom apartment, fire officials said. This building contains six two-bedroom apartments on three floors. Although the residents of the apartment where the fire originated were not home, other residents of the building were home, and were evacuated safely. 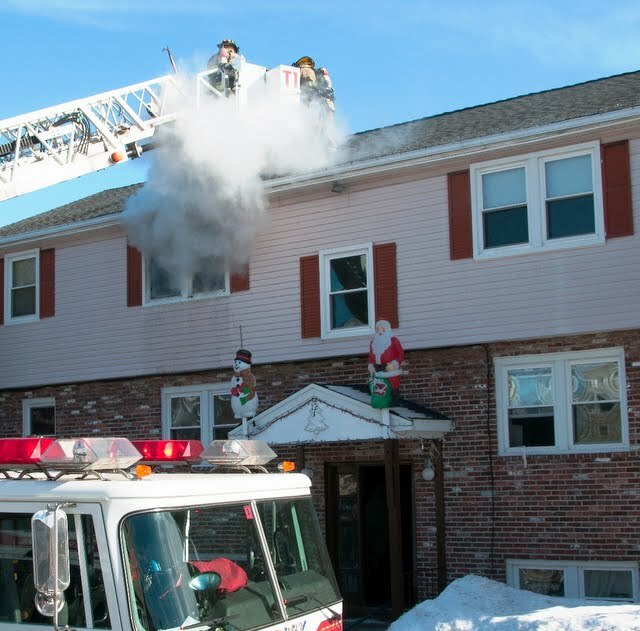 Fire crews searched the building and ventilated the roof and attic, which made it possible to contain the fire and most of the smoke to the apartment where the fire started, officials said. As a result, there was extensive fire, smoke and steam damage to the third-floor apartment. All contents throughout the apartment were burned by the fire, melted by the high heat or destroyed by heavy black smoke, officials said. Other apartments suffered no damage, although some smoke damage to the common hallway on the third floor was reported. All tenants were allowed to reoccupy their undamaged apartments. There were no reported injuries, and the cause of the fire remains under investigation.